I’ve never really had a vested interest in Singapore until I became a mum. It’s been a week since Singapore celebrated her jubilee birthday on 9th August, yet I still find myself humming to the tune of “Home” ever so often; sometimes to the extend of getting my eldest son to sing along the chorus much to his reluctance and annoyance (because “1,2,3,4,5 once I caught a fish alive” sounds way more catchy to a 3-year-old). I can’t help it, I absolutely love the lyrics of that song. “You’re damn on hor”, a friend said when I told her I wasn’t free to meet during the week leading up to Singapore’s Jubilee Birthday because I wanted to shop for Singapore-themed tees for the family to wear over the long National Day weekend. It was after all Singapore’s 50th birthday, and we wanted to pay her a tribute by wearing our national identity loud and proud on our sleeves. Yet embarrassingly enough, I wasn’t always this bothered with Singapore. I grew up in a time (Gen Y) when most needs was starting to become a given and it was easy to take a lot for granted. Then, Singapore had already achieved major economic success and there was little to worry about, with most of our hierarchy level of needs being met. Being born in a post independence era also made it challenging to relate to the hardships read in the history textbooks vs. the ever changing landscape and modern city state that I was greeted with on a daily basis. By the time I became more acutely aware of Singapore’s current affairs and had a better grasp of what was being published in our national daily, we were no longer led by the our first Prime Minister, a figure I heard limited adjectives of – “firm”, “strict”, “necessary”, “leader”, “iron-fist”. While I grew appreciative of the style of leadership that resonated with the gen Ys with our second Prime Minister, I wondered about the what-ifs, if we were still under the continued “tough love” leadership of our first. Especially so after reading the outpouring of love and plethora of tribute articles which surfaced and circulated non stop during the national mourning week of our first Prime Minister earlier in March this year. Clearly even in young adult life and parenthood, I continued to take a lot of things for granted more than I would like to admit. With the advent of the Internet and globalisation catching up with us Gen Ys, I became engrossed with pop culture, BGRs, IRC-ing, playing first person shooter games that taking any interest in the nation’s affairs weaned inevitably. Like I’ve mentioned before, I used to assume those who had national interests at heart was for those who wanted to pursue politics and government as a career and so that mindset pretty much shaped my “plebeian” attitude towards Singapore, except when it came to party time on 9th August when that iconic flypast of the state flag never fails to get some tears and a heartwrenching moment from me. This year, as I reflect with thankfulness and gratitude on our 50th year as an independent nation, a strong sense of pride and belonging overwhelms me. For the longest time I’ve been asking what makes me Singaporean yet when I asked myself what Singapore means to me for the purpose of this post instead, I was confronted and comforted that it goes beyond the air-condition and fine nation that we have, beyond our interesting and delicious local food culture, beyond a durian icon that has been institutionalised at the Esplanade. They say, motherhood changes you. And damn right it has. My stronger realisation of our country’s progress as a result of wanting a better quality of life far precedes the stiff and escapism mindset I used to hold before becoming a parent. For the sake of my kids and their kids, taking on a bigger interest in state affairs now matters more to me than before. Singapore’s history has taught me that one person’s determined actions can make all the difference. This is where wanting to improve and dream big is embraced and celebrated. This is where letting nothing stop those who dare to dream and making sometimes unpopular but necessary decisions are welcomed. Regardless of your race, religion or background. This is where being a citizen itself is a valued commodity and people are the nation’s “natural resource”. Which means even as a parent, you are already making that difference by moulding the future of the nation’s “natural resource”. So what does Singapore mean to me? It is definitely more than just my birth place and country of residence. It is my HOME, a safe secure, happy, warm fuzzy feeling in my heart. It will always be one that holds a more personal meaning to me when I sing the song. Here’s to shaping a better Singapore, as we work towards her centennial birthday milestones which I am sure will be nothing short of ordinary if the SG50 celebration was any indication. As a personal wish, I pray that we will get to witness and celebrate SG100 together as a family. To my boys, I hope this quote from the late Mr Lee will always inspire you. Majulah Singapura! May it continue to be your home of dreams, ambitions and love as it did for me. 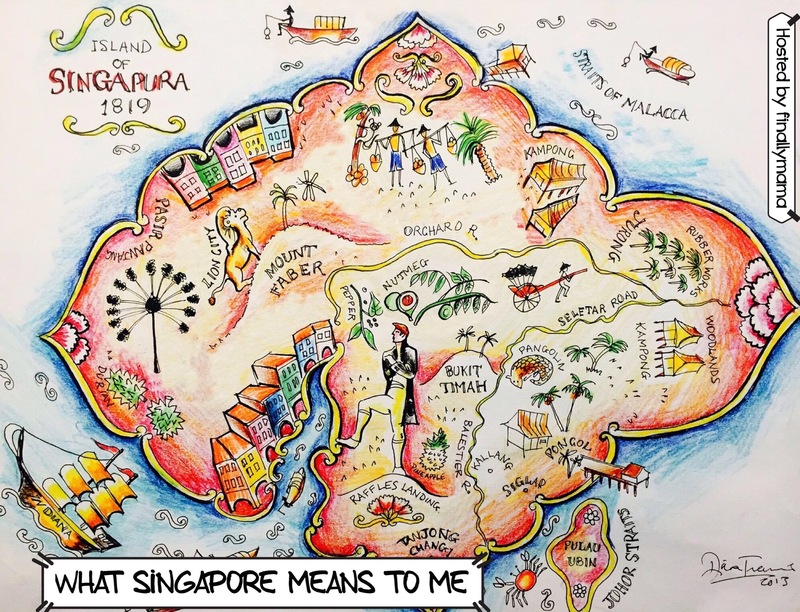 This post is part of FinallyMama’s What Singapore Means to Me blog train. Hop on over to see what Singapore means to these other parents. Singapore Next up on the blog train is Jennifer or DinoMama as she is fondly known as to some. A full time working mum who believes home cooked meals are the best and tries to cook healthy meals for her family as often as possible. When she is done coaching DinoBoy with his school work or not playing & bonding with him, she will be sitting at a comfy corner in the house busy working on something on her crochet hook. One day she hopes she will be able to be a full time stay at home mum where she can fuss over her family 24/7.